Drive down the sun dappled approach to the 900 acres that encompass Tchefuncta Club Estates and travel back to a time when life on the northshore was simple. Tchefuncta families cherish the simple beauty of life among the trees and along the river as St. Tammany residents did for generations. 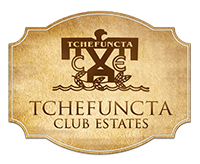 Homes in Tchefuncta Club Estates are placed on large wooded lots off winding lanes. Surrounded by 460 acres of dedicated green space. Launch your boat from the marina or picnic and play at Lake Emfred. Membership in Tchefuncta Country Club brings even more benefits, including golf, tennis, swimming, a fitness center and a fine dining restaurant.